There was a time when archaeology was Israel’s national hobby—part of the excitement of building a new country over the foundations of the past. It was one of Zionism’s tools for putting down roots. But as the new nation developed and prospered and its existence became a fact, the new generation of Israelis turned to other fields of interest—often involving material prosperity and travel. More to the point, many Israelis tired of Zionist slogans and ethnocentricity, feeling that these have contributed to Israel’s ongoing conflict with its Arab neighbors and citizens. Since Israeli archaeology has traditionally been seen as an expression of Zionist ideology much of the younger generation, which grew up in the 60s and after, has shown little interest in the physical remains of Israel’s past. One only has to look at the declining visitation numbers at the country’s archaeological parks. This does not mean that archaeology has no attraction. But the attraction lies, as it does in many other western countries today, in the study of ancient people and civilizations as a more general search for human origins and a more inclusive curiosity about the mysteries of the past. Nationalistic archaeology is passé, but the adventure of archaeology is definitely “in”. Let’s be clear: the archaeology of ethnic or national identification has not gone away. It’s still here and it still motivates important sectors of Israeli society. Does this mean that nationalistic archaeology is illegitimate? Not necessarily. Archaeology that identifies with a particular narrative is negative only when it claims exclusivity or sole ownership of the past. We feel that we can accept nationalistic identification and interpretation as long as other narratives are not excluded. Most importantly, archaeology is about people and their behavior way back in the mist of ancient times. It is a three-dimensional puzzle whose outcome is never certain. It is, by definition, an adventure. The adventure of archaeology is the jumping-off point for the Givat Sher Community Archaeology Project. The Nelson Glueck School of Biblical Archaeology of the Hebrew Union College has embarked upon a community archaeology project in the new town of Modiin. The Nitzanim elementary school has adopted Givat Sher, which is located within walking distance of the school. Together with the kids, teachers and parents, we are surveying, excavating and reconstructing selected elements of the site. Our research format has a landscape archaeology orientation, which means that we collect environmental data and investigate agricultural installations, burial features and intersite relations. This will be a long-term project that has already expanded to include other parts of the community—the Modiin municipality and the Society for the Preservation of Nature are full partners. Thus far we have conducted two seasons of full-fledged excavation, one in spring, before Pesach and the other in August 2004. Altogether, approximately 2000 people have participated with mountains of enthusiasm. We estimate return visits at about 20%, though this figure increased toward the end of our August season—a good sign. The spring season field trips and classroom activity focused on the Nitzanim Elementary School community. The summer season continued this project but opened it up to the whole town and to guests from outside the Modiin area. The Givat Sher dig is serving other communities as well. One of these is the Hebrew Union College students and faculty. The students of the first year program in Israel dig in at least two different frameworks. One of these is an enrichment program for students who chose to spend a week in the field with us, to learn the nitty-gritty of how field archaeology works. The other framework is that of the program’s Land of Israel course in which all the students will come to dig for a day, to at least taste what archaeology does. The students will have other opportunities to be in the field with us, and may especially want to join in when we work with the Modiin public. This can be a good opportunity to practice Hebrew and to rub shoulders with “just folks” having fun. The World Union of Progressive Judaism now also has its own excavation. Congregations and any other affiliated organization can contact us here at the Nelson Glueck School of Biblical Archaeology and reserve a day of archaeological adventure. This is a special kind of activity, that can be done in conjunction with the Modiin community or not, and the modest fees will help us maintain our program. The program will be opened up to other organizations in Israel and abroad, depending upon our manpower and finances and upon our ideological motivation. An excavation is a great place for building bridges with different constituencies and for just making friends. The Nelson Glueck School of Biblical Archaeology (NGSBA) of the Hebrew Union College-Jewish Institute of Religion (HUC-JIR) is an research institution with an academic orientation. In the past it has focussed on archaeological excavation and publication intended mainly for professional audiences. In recent years our mandate has changed; we are now aiming for a wider audience and for partnership with our public. Scholarship will continue, and we will endeavor to achieve excellence and innovation in our field, but we also feel to share our expertise and enjoyment with a broader section of society. Belonging to the Progressive Jewish Movement, the NGSBA champions a pluralistic approach to historical narrative and a skeptical, non-dogmatic approach to our findings. Archaeology, the study of related biblical texts and the dissemination of new data and insights are a crucial part of achieving Jewish literacy. The best ways to achieve these aims are (a) to involve active participation by large numbers of lay people in our fieldwork and (b) to make the excitement of our research available to wide audiences by electronic means. The NGSBA provides all the archaeological staff and equipment, gives lectures and leads fieldtrips and surveys over the course of the year. The Nitzanim Elementary School of Modiin has adopted Givat Sher as a means of creating a sense of rootedness amongst school children and their families in what is a very new town. 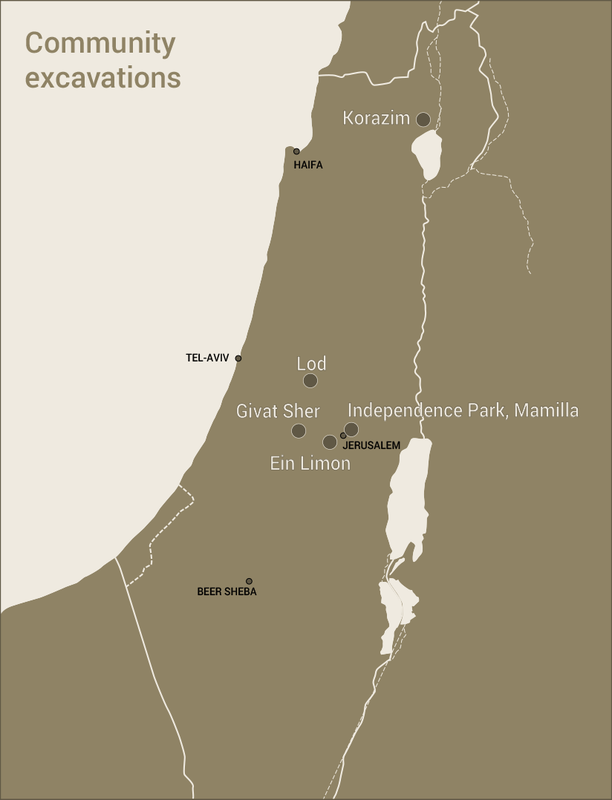 The Givat Sher project is also seen as a way of teaching kids the techniques and thinking behind environmental and archaeological research. At the most basic level, the school’s outings and excavation in spring comprise the kinds of activities that create solidarity in the school’s community. Solidarity is a social force that can effect change and work for a community’s greater good. We have already conducted two seasons of full-fledged excavation, one in spring, before Pesach and the other in August. Altogether, approximately 2000 people have participated with mountains of enthusiasm. We estimate return visits at about 20%, though this figure increased toward the end of our August season—a good sign. The spring season and the field trips and classroom activity was focussed on the Nitzanim Elementary School community. The Nitzanim Elementary School pays for the study program run by the SPNI and the parents committee supplies publicity and website development. Society for the Preservation of Nature in Israel (SPNI) has constructed a multifaceted, year-long program that includes units in botany, zoology, geography and archaeology. Students learn the value of a multidisciplinary approach—how things are really connected and why it is important to preserve the environment. Since Givat Sher is slated to be a park, the SPNI sees the project as a way to educate a generation of “docents” who will care about preserving the park and eventually shoulder the burden of maintaining it properly. The SPNI has created the ecological education program and is paid for its year-long course, which includes numerous outings. It also provides publicity in its nation-wide publications and support staff for collecting fees at the excavation and maintaining order on site. The Modiin Municipality views the Givat Sher project as a contribution to its citizens’ quality of life—a source of intellectual stimulation and family enjoyment. The project is also seen as a force for the creation of community solidarity and involvement. The municipality provides funds to subsidize ecological and cultural resource education. It also provides valuable logistic support for the Givat Sher excavation: insurance, transport and storage of our tools and water, security guards and medics.